Angelica - Colorway - Repaint of first ornament in the Mary's Angels series - 2006 - Designed by Mary Hamilton - Sculpted by: Robert Chad - QXE4466. a joyful garden of the heart. 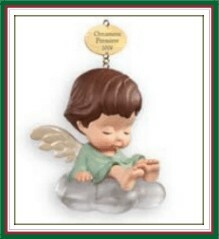 This repainted version of the first ornament in the Mary's Angels series was issued in limited quantities and first available at the 2006 Keepsake Ornament Premiere event.